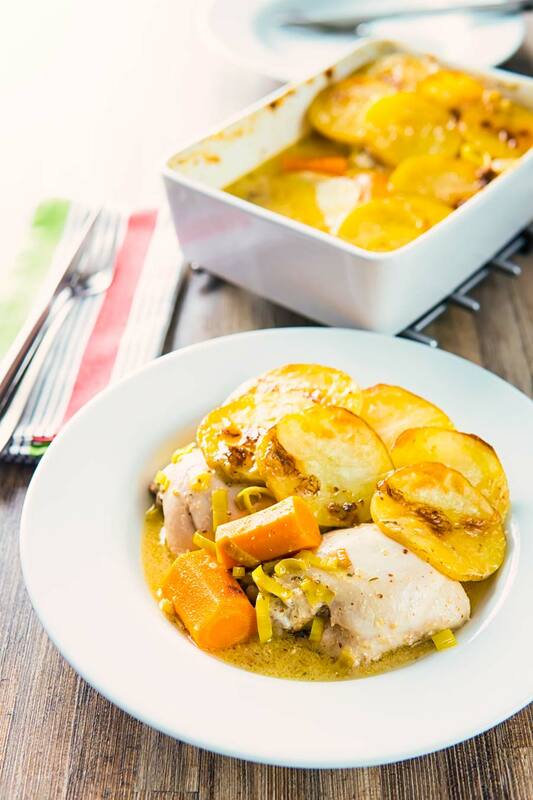 A hotpot is a little like a pie with a scalloped potato topping, this chicken hotpot features a mustard sauce and lots of leeks and carrots. 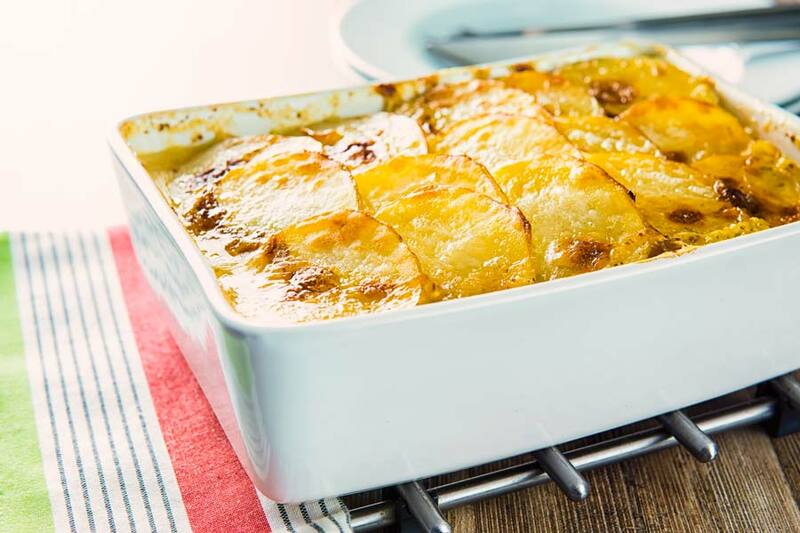 It is definitely warming comfort food season and this hotpot recipe definitely fits into that category. 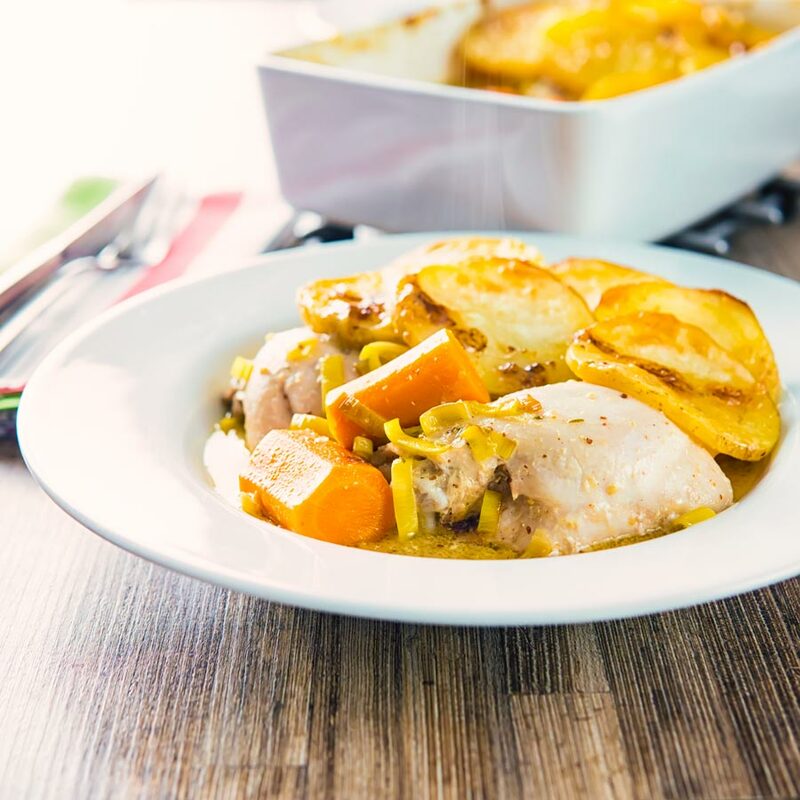 Flavour filled chicken thighs are cooked on the bone in a roux-thickened sauce. A sauce that is flavoured with wholegrain and dijon mustard and some thyme. All of this is topped with a scalloped potato topping and baked in the oven. Just like my lamb hotpot, it is a pie without all the faff and hassle of pastry! Even as an experienced cook if there is one thing I hate in the kitchen it is pastry, so this simple pie recipe is perfect. 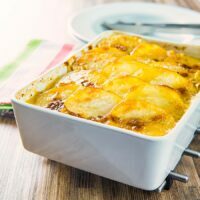 Using potato as a topping to a pie is pretty common occurrence in British food and not just on hotpot. There is, of course, the classic shepherds pie, a minced or leftover lamb topped with mashed potato. The shepherds pie is often confused with the cottage pie, which is the name for the derivation involving beef. There is also a shepherdess pie, this is a vegetarian variant and the Cumberland pie which has a cheesy breadcrumb topping. It would seem the British have a long history of being pastry dodgers. The cottage dates back to the 1790’s, 50 years before the shepherds pie! Cooking Meat On The Bone. It is pretty unusual to cook chicken on the bone in a pie, but in this instance, it works really well. We make stocks and broths from bones all of the time. So cooking the sauce for this recipe with bone-in chicken thighs just intensifies the flavour. If cooking is about anything it is flavour and as this pie cooks for an hour it means that the meat falls off the bone. As a result, there is no worry about messily rescuing the last morsel of meat. As with all recipes, seasoning is key to flavour and your stock will define how much salt is needed in this recipe. Taste your food as you go. Always! A roux is nothing more than a mixture of fat and flour that is often used to thicken a sauce. It is also the base for choux pastry. Many people seem very intimidated by the process of making a roux but it is really very simple. Melt butter, add flour then stir to cook out the flour. Then all you need to do is add your liquid of choice a little at a time stirring constantly to get rid of any lumps. A roux is probably most well known as the base for a bechamel sauce. The bechamel is at the heart of the cheese sauce for my very British Welsh Rarebit recipe! 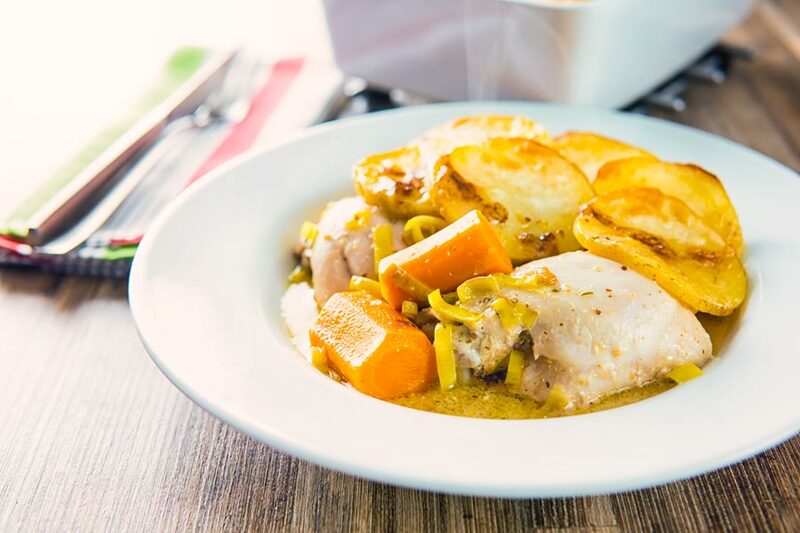 Recipe Hints and Tips For Chicken Hotpot. If you are looking to scale this recipe upwards the amounts all scale linearly very well. However, you do not need to increase the cooking time in a linear fashion. You should be able to cook this recipe in the same amount of time when scaled up. So long as you cook it in a casserole dish 5-6cm deep. As with all chicken you are looking for the meat to be 73°C or 165°F internally in order for it to be safe. You can switch out the thyme for dried if you like and 1 teaspoon of dried thyme should see you about right. Finally, I do not think this recipe makes for great leftovers so cook for the amount you need. Begin by slicing your leaks. Peel and cut your carrots into 2.5-3cm lengths. Slice your potato into 2-3mm round slices. Heat half of the butter in a small pan and the other half in a frying pan. When melted add the flour to the small pan and the leeks to the frying pan. Stir the flour to form a roux whilst the leeks soften. After the flour and butter roux has been cooking for 2 minutes start to pour in the chicken stock a little at a time until it is all incorporated in a thickened sauce. Add the mustard and the thyme to the sauce before tasting and adding salt as required. Place the chicken thighs in the base of a 16cm x 22cm casserole and light season with salt. Nestle in the carrots and add the sauteed leeks. Pour over the sauce and then add the potatoes to the top of the hot pot. Brush with a little melted butter and add a little sprinkle of sea salt. Throw in the oven and cook for 60 minutes at 180°C or 350°F. Well, this seems like quite the perfect comforty dish! Love the use of leeks – I don’t use them enough in my cooking. This would be a wonderful meal to come home to at the end of the day. Thank you. I love using leeks at this time of year! This looks absolutely gorgeous! I am totally loving the whole thing, particularly for this time of year! It certainly is a very seasonal dinner! What a tasty looking hotpot! 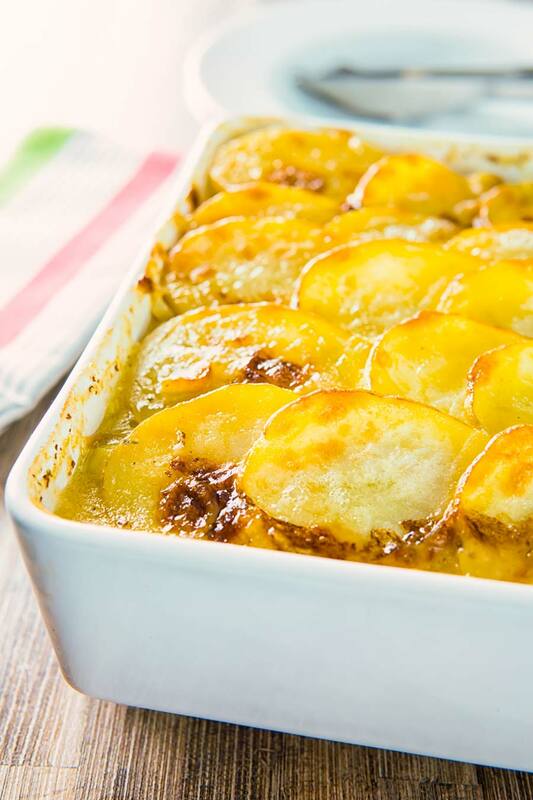 I love those scalloped potatoes on the top – they look so good. I love chicken hotpot – looks so comforting and delicious! Perfect for the winter! I never made a hotpot before, really need to try as this is perfect for the cold winter days! A comfort food meal is my favorite type of meal. All year long! Is it strange I’ve never had or heard of dish called a “hotpot?” Is that a British thing? I love it. 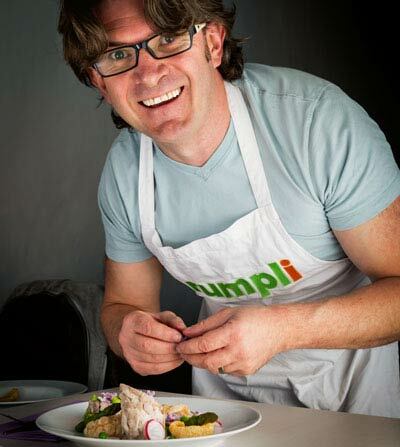 And I’m jumping over the your lamb hotpot next.